You will find these to be among the lowest movers cost in Houston, Texas! We are committed to being the moving company leader on all of your moving needs while providing honest professional service. We have the best Movers cost in Houston. We work hard to eliminate the things that add cost to your moving. This means you get exclusive service all around. We know how much strain moving can put on you. So that’s why we say, “sit back and let us do the hard work.” We have a variety of moving trucks to fit your needs (9ft., 18ft., and 24ft.). 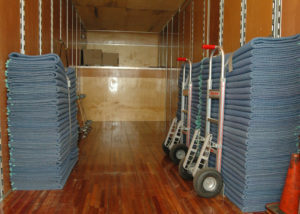 Our trucks are equipped with ramps, lift gates, dollies, and plenty of blankets to protect your furniture from damage. Johndmoving is your low cost answer for private moving in Houston. Despite the fact that Houston moving can be unpleasant, picking Johndmoving and their staff of authorized proficient movers, will make your private moving knowledge simple, smooth and extraordinary. It begins with our inviting moving specialists who gauge and plan your turn. Most essential, we don’t utilize day workers, just experienced proficient movers. We are the low cost movers Fresno and Low Cost movers Houston. Note: Sundays and holidays add $10 to all hourly fees and there is a 3 hour minimum to the 2 and 3 Men rates and options shown above. For 4 Men Move on Sundays and holidays add $20 with a 3 hour minimum. Rented – $3.99 **Must be returned at the end of the move. Flat Fee Estimates are FREE. *It’s the time it takes from our location to yours, and the next. Travel time price may change depending on the area.